There have been many analyses of leisure, drawing on the social, historical, cultural, temporal, and geographical contexts in which acts of leisure are pursued. Yet these studies lack a theoretical framework that can explain how leisure studies interact in various social contexts (cultural, temporal, or geographical), or as Robert A. Stebbins conceptualizes it, at levels of society. Here Stebbins explores leisure studies at society's micro, meso, and macro levels. He considers all three as they manifest themselves in the everyday pursuit of leisure, while focusing on the heretofore neglected middle, which he calls the meso side of life. Stebbins not only draws these perspectives together, but does something no one else has: he focuses on the big picture of leisure. 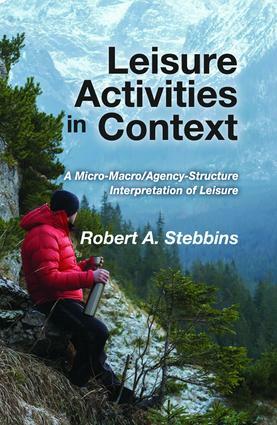 Leisure Activities in Context examines the entire micro-macro/agency-structure dimension, using theory and research from leisure studies and the sociology of leisure as the vehicles to accomplish this. This book will be a useful theoretical sourcebook on the study of leisure because it provides a blueprint of issues that scholars and students can use to draw deeper meaning from their own studies, and a framework for future research.